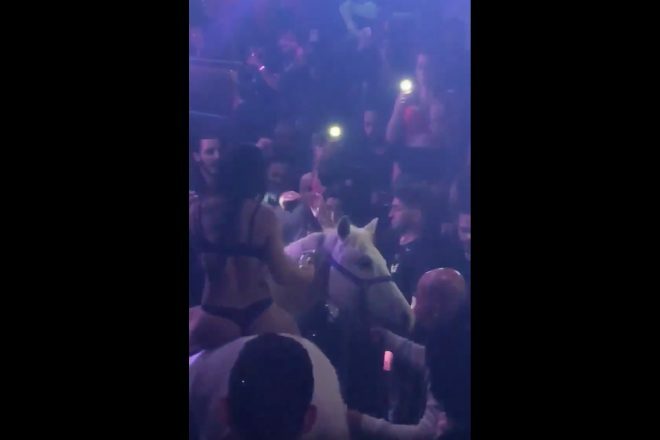 Just when you thought glitzy, bottle-service nightclubs couldn't get any worse, someone decided to force a live horse into the mix of a packed Miami nightclub. A venue in the Florida city called Mokai Lounge is now under investigation by the Miami Beach Police after cell phone footage of a woman in a bikini riding in on a horse turned awry when the obviously frightened animal began to buck her off in attempt to escape the crowded, loud room. Immediately, viewers of the video were quick to bring up concerns about animal cruelty, as well as the lack of forethought or concern about safety. "They're lucky nobody including the horse was seriously injured or killed," a Facebook comment reads. "We are very concerned over the allegations," Officer Ernesto Rodriguez said of the incident to Miami New Times. "As such, we have launched a joint investigation with Miami Beach Code Enforcement.